Requires a key on both the inside and outside to lock and unlock the door. Best suited for doors that have glass panes on or near the door. Prevents an intruder from breaking the glass and reaching in to unlock the door. 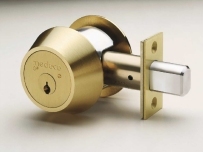 Recommended for use on businesses to secure doors after hours when the building is unoccupied. 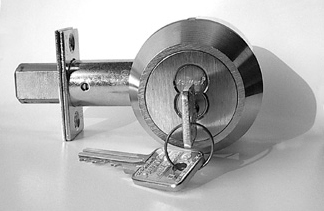 Extreme caution should be used when installing double cylinder locks on homes or apartments. Always check local building codes and make provisions to have a key hanging nearby or have at least one other door that does not require a key to exit. You should also consider using Medeco's captive thumbturn deadbolt.